•　Build a working relationship with your students based on mutual trust, respect, and appreciation. •　Be attentive to your students’ needs and share ownership of the classroom with them. •　Break out of the vicious cycle of punishment and reward to control student behaviour. •　Use innovative and creative lesson plans to get your students to become more engaged and intellectually-invested learners, while still meeting your state standards. •　Limit homework and abandon traditional grading so that your students can make the most of their learning experiences without unnecessary stress. New to the second edition, you’ll find practical tools, such as teacher and student reflection sheets, parent questionnaires, and parent conference tools--available in the book and as eResources on our website (http://www.routledge.com/9781138916920)—to help you build your own classroom of passionate learners. "Creating passion-infused learning environments where students are allowed to discover and have learning opportunities beyond the classroom is a best-practice pedagogy that is slowly but surely finding its way into classrooms. Pernille Ripp is at the forefront of this movement. I hope educators will give this book a chance as it gives ALL students the opportunity to be the driving force behind their own education." "All teachers gather "best practices," whether through training or time. But these techniques don't always work as planned. 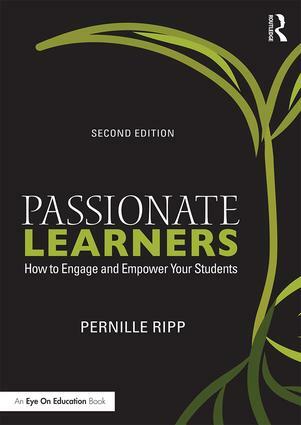 Pernille re-examines the common habits of the classroom and reveals new, more productive ways of cultivating passionate learners. From grades to school culture, she shows that nothing is free from critique when you fight for students." "This book is an excellent guide to transforming your classroom culture and letting students take ownership of their learning. Pernille Ripp offers practical tools that will help all educators create a positive and innovative learning environment for their students." 2. Would You Like Being a Student in Your Own Classroom? 3. So You Got the Job. Now What? 5. The First Day of School: Who’s In Charge? As a teacher, speaker, and author, Pernille Ripp's work has influenced thousands of teachers globally, as well as the work of school districts across the United States as they try to empower their students and teachers and change the way we educate. Pernille’s work and thoughts have been included in multiple influential education books published in the last three years. She continues to teach, constantly trying to forward the educational journey of students in her district, and implementing all of the ideas she presents. In 2010, she created The Global Read Aloud, a global literacy initiative that since then has connected more than 500,000 students in 60 different countries. Her first book will be republished this fall by Routledge and is called Passionate Learners: How to Engage and Empower Your Students. Her second book Empowered Schools, Empowered Students was published in September, 2014. Her work has been featured by Edutopia, School Library Journal, MiddleWeb, Learning & Leading magazine, as well as in many podcasts and interviews. She is a Skype Master Teacher, as well as a Microsoft Innovative Educator Expert for 2015. She is the WEMTA Making IT Happen award recipient for 2015, as well as the 2015 ISTE Award for Innovation in Global Collaboration Award recipient. She teaches others how to give the classroom back to students through webinars, as well as to anyone who walks into her classroom. Her blog has been nominated for several major blogging awards, and her own students blogs’ have had more than 600,000 unique views since they started writing. Follow her on Twitter @pernilleripp.